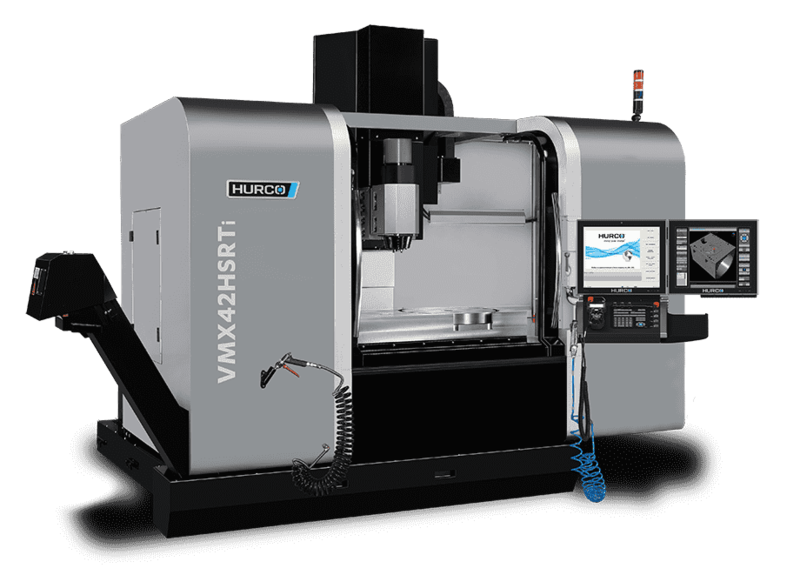 The SR series of 5-axis CNC mills offers multiple advantages, starting with the machine's design configuration that utilises a swivel head with either an A or C style rotary table. The generous size of the rotary table provides maximum versatility because you can use the extra table space for secondary operations or 3-axis work. There are specific applications where a swivel head 5-axis VMC is the best choice. The design of the swivel head 5-axis machining centre makes the SR the best choice for certain applications. Versatility. The large rotary table provides versatility that allows you to use the extra table space for secondary operations or 3-axis work. Heavier Parts. Because the table is stationary, the swivel head/rotary table 5-axis machining centres are typically preferred when machining heavier parts. Unlimited angular movement of C-axis. With a swivel head/rotary table 5-axis machining centre, it is extremely important to make sure the table (C-axis) supports unlimited angular movement. For example, if you are machining down a steep wall and going around the part, the table needs to rotate in a continuous motion. If the C-axis is limited to +360 / -360 degrees of motion, it will literally need to unwind at regular intervals to machine the part. Conversely, the tables on the Hurco SR 5-axis mills are built with unlimited and continuous rotation because our focus from design to delivery is to maximise productivity and profitability for our customers. Tool access for swept surfaces and complex contours. There are certain applications, such as impellers or turbines, when it is beneficial to approach the part from underneath. When you mill uphill, as it is sometimes called, the base of the spindle is lower than the tool tip. The B-axis tilting head with the C-axis rotary table of the SR machining centre supports this type of cutting strategy, whereas a trunnion style 5-axis mill doesn’t. Hurco has a host of features designed to make 5-sided and 5-axis more efficient. Tool Centre Point Management eliminates the need to account for the machining centre’s centrelines of rotation. Instead, you simply use the solid model zero location. Post the program independent of where the stock is fixtured on the table. Transform Plane allows you in one simple step to position the part to the side you need to machine by calculating the other locations for each of the rotary moves after you locate part zero. The control software only needs you to define part zero one time, and it figures out all of the other part zero locations automatically. 3-D Tool Compensation eliminates the need to repost the program in order to adjust the tool diameter because of wear. For 3D surfaces, machinists cut off the tool’s centreline to obtain a better surface finish and preserve tool life. This feature allows you to compensate for wear without the need to repost. Tool Vector Input allows the control to compute machine angles and positions, and calculates the angle the tool will tilt from the contact point of the surface. This means the part program is machine independent. 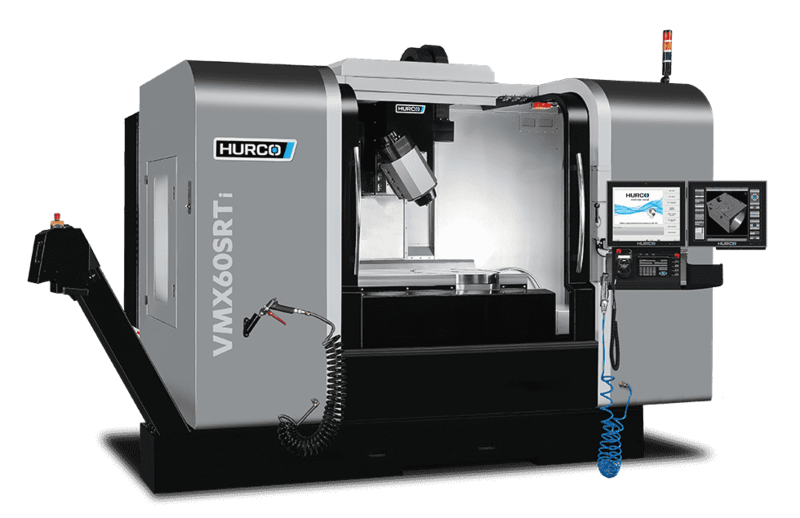 At Hurco, we are immersed in 5-axis technology. We have carved out a niche in this arena because we made a commitment nearly a decade ago to focus on 5-axis. We determined this type of machining centre, combined with the capabilities of our control, would make our customers more profitable. Similar to the transition from manual mills to CNC mills, we believe the time is right for shops across the country to increase profit margin by investing in 5-axis. 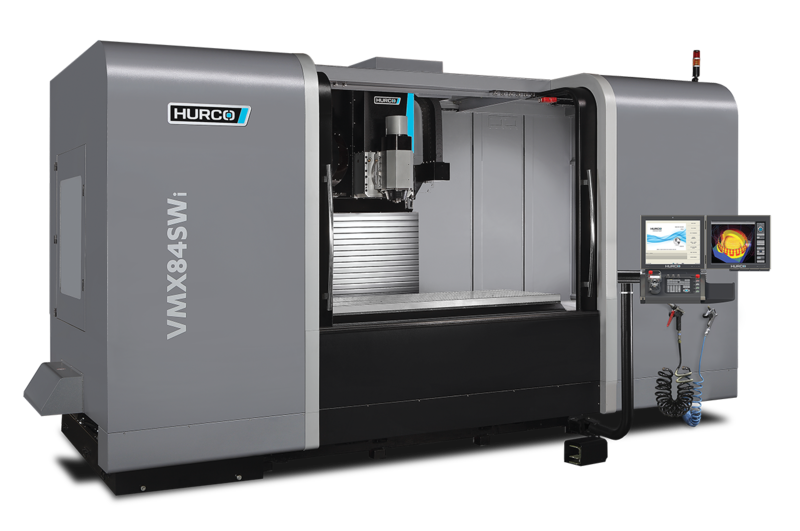 Because we listened to our customers' reservations about switching from a 3-axis process to 5-axis, we assembled a 5-axis applications team with a dedicated phone number and email to help. If you do NOT OWN a 5-axis machining centre, the most important message you need to know: 5-sided machining on a 5-axis VMC will increase the profit margin of the parts you are producing on your 3-axis machining centres. The Hurco control makes programming easy for 5-sided---NO CAM needed! We say it all the time: we have the best customers in the world! Truly, they are the epitome of the American work ethic, American ingenuity, and a "get it done" attitude. We are honored to be a part of their business. Their endorsement is our greatest advertisement.